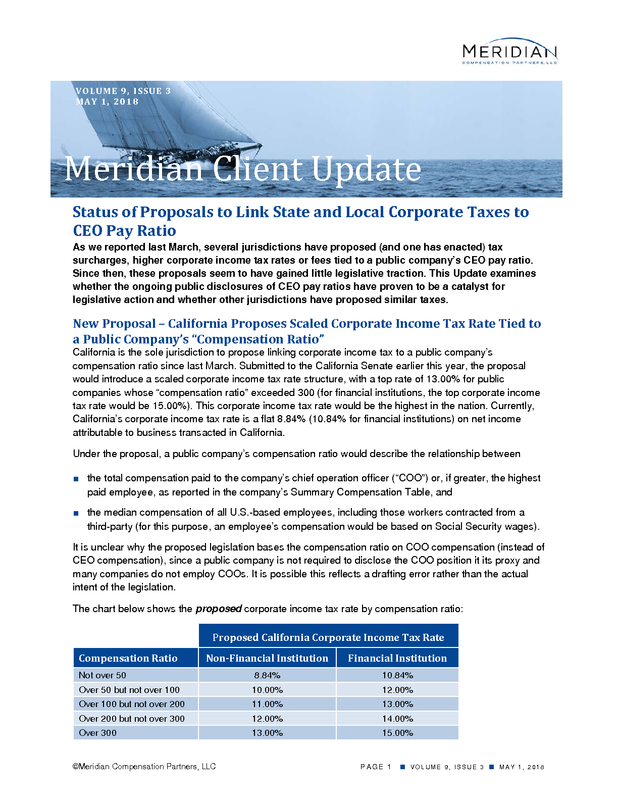 California is the sole jurisdiction to propose linking corporate income tax to a public company’s compensation ratio since last March. 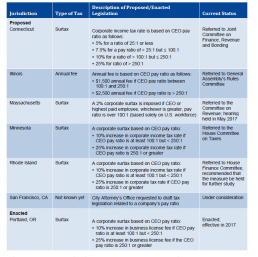 Submitted to the California Senate earlier this year, the proposal would introduce a scaled corporate income tax rate structure, with a top rate of 13.00% for public companies whose “compensation ratio” exceeded 300 (for financial institutions, the top corporate income tax rate would be 15.00%). This corporate income tax rate would be the highest in the nation. Currently, California’s corporate income tax rate is a flat 8.84% (10.84% for financial institutions) on net income attributable to business transacted in California. ■ the median compensation of all U.S.-based employees, including those workers contracted from a third-party (for this purpose, an employee’s compensation would be based on Social Security wages). It is unclear why the proposed legislation bases the compensation ratio on COO compensation (instead of CEO compensation), since a public company is not required to disclose the COO position it its proxy and many companies do not employ COOs. It is possible this reflects a drafting error rather than the actual intent of the legislation. 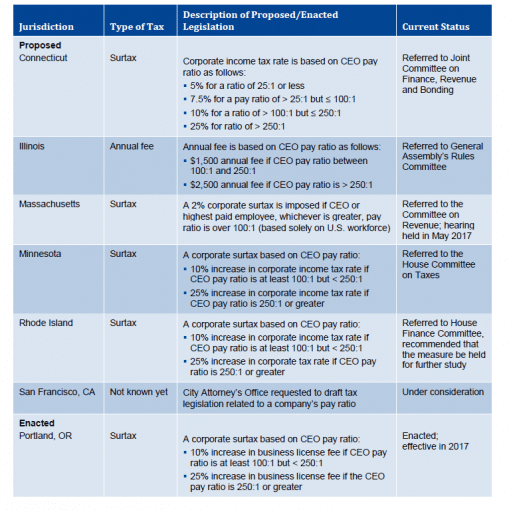 The proposed legislation would also impose a tax surcharge of 50% on these scaled corporate income tax rates for a public company that during a tax year reduced its U.S. full-time workforce by more than 10% and increased its foreign-based full-time workforce by any number. For passage, two-thirds of the California Senate and Assembly must approve the legislation. If enacted, the proposed legislation would be effective for taxable years beginning on and after January 1, 2019. California joins six other jurisdictions with proposed legislation that would impose tax surcharges, higher corporate income tax rates or fees based on a public company’s CEO pay ratio. To date, only the City of Portland, Oregon, has actually enacted such legislation (i.e., tax surcharge based on a company’s CEO pay ratio). The following table summarize the proposed and enacted legislation. Meridian Comment. 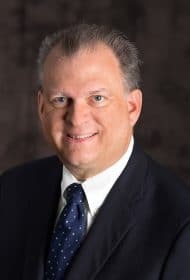 The recent disclosures of CEO pay ratios has neither caused a flood of new jurisdictions proposing taxes linked to a company’s CEO pay ratio nor any meaningful movement on outstanding legislative proposals. We believe this reflects the largely symbolic nature of these tax proposals, which do not appear to have broad-based legislative support. In fact, the California proposal is the third attempt to pass such legislation in that jurisdiction. At this juncture, we would be surprised if any of these proposals were enacted.